This time I would like to cover a very different aspect of energy and its usage in everyday life. So far there is no apparent lack of energy, technically speaking. Energy is available in abundance, and the only restriction to using it is the price we are asked to pay for it. Thus big users will eventually find themselves paying a huge bill. But it´s not only big consumers who might face a hefty burden from their energy bill. More and more people are using a substantial amount of their available income in order to buy the energy they need. In particular, this is true for heating which is also one of the biggest parts of private energy consumption. 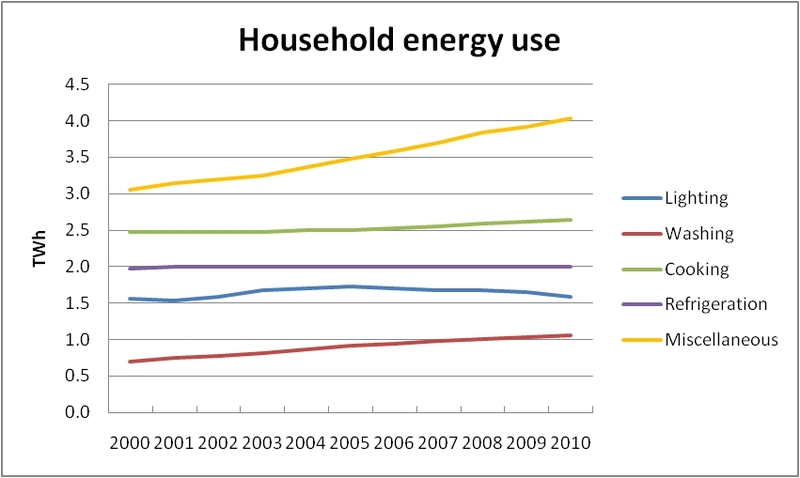 The UK statistical office is collecting data on fuel poverty. The term refers essentially to energy needs for heating purposes and the relative amount of household income people have to spend in order to “maintain a satisfactory heating regime”, i.e. 21 °C in the main living area and 18 °C for other rooms. In particular, people are considered to suffer from fuel poverty if they have to spend more than 10% of the household income on fuel for heating. 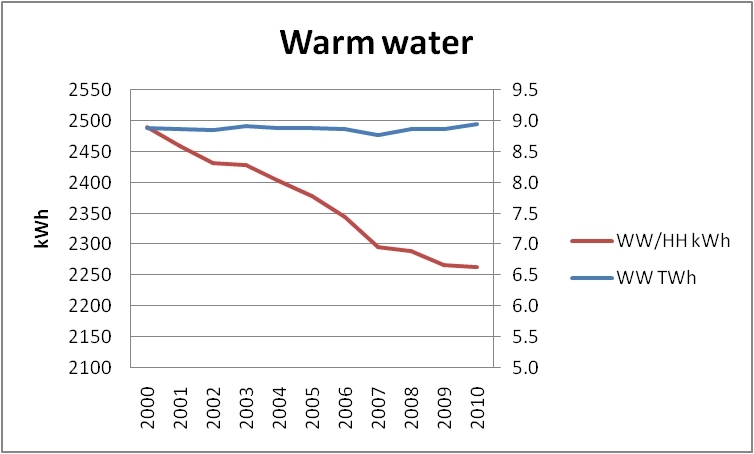 The figure below gives a sketch of the situation in the recent past (2003 and 2009). Number of fuel poor households in millions. Abbreviations: dc – dependent children, hh – household. The first observation we make is that the number of fuel poor households has apparently dramatically increased between 2003 and 2009. During that period the number of households concerned has, on average, more than doubled. Thus, fuel poverty in the above sense is definitely increasing and showing a severe social impact. Energy is becoming a scarce and to some extent even luxurious commodity. Another observation is that specific groups are particularly hit by this phenomenon. People without dependent children are more likely to suffer from fuel poverty than those having kids. Moreover, persons older than 60 years are also facing a greater risk of getting fuel poor. The same is true for single persons when compared to couples. The causes for this are manifold. Energy prices are on the rise. They climb faster than the average income, especially for retired people. Another factor is certainly the economic crisis which hit a number of European countries in 2008. So far we are still far from a sustainable recovery. Therefore, we may well assume that the situation has aggravated in the meantime. Yet another factor coming into play is related to economic circumstances: Many elderly people may not be able to afford refurbishing their houses such that they consume less energy, especially for heating. Renovating old houses is a costly undertaking which may simply go beyond many people´s financial capabilities. 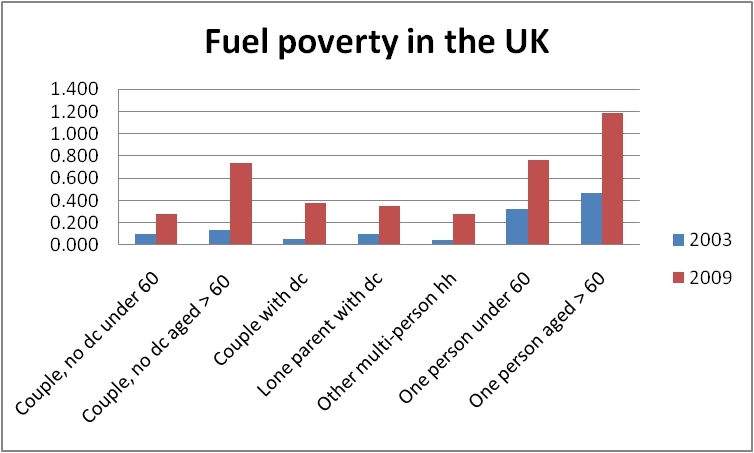 Fuel poverty is a critical issue not only in the UK. Also other countries like Germany encounter the same problem. However, most of those countries do not collect the respective statistical data as is the case in the UK. Therefore, it is extremely difficult to assess the severity of fuel poverty for other countries. Taking into account that energy is of critical importance to the functioning of our societies, it would be highly desirable to collect those data in order to tackle the problem as soon as possible. Do Energy Saving Light Bulbs Really Save Energy? Some considerations about the usefulness of energy saving light bulbs. Conventional light bulbs which are now banned in the EU since 1st September 2012 are very inefficient when it comes to turning electrical energy into visible light. More than 90 % of the energy input are emitted in the form of heat. Thus with a less than 10 % efficiency in terms of light production the classical light bulb may indeed look a rather hopeless case and energy saving lamps appear to be the preferable choice. However, a closer inspection shows that the odds are not at all so bad for the conventional lighting medium. During the cold season, i.e. whenever people feel the need of switching on their heating, the classical light bulb contributes to the heating effort. Thus whenever we count heading degree days the old fashioned light bulb lowers the need to switch on the heating. From a physical point of view during the heating period the energy saving light bulb does not save energy. That is a simple deduction from the law of energy conservation. On the contrary, if we turn to energy saving lamps, the work load of our heating systems gets higher. In addition to that we assume an average performance of 200 W(el). Our model is then applied to two European cities, one in the northern (Stockholm) and the other in the southern part (Rome). From this model it follows that the maximum number of lighting hours per day is 9 which is reached during the dark winter months. On the other hand, during the long daylight hours in summer, it may be necessary to switch on the light for no more than 2 hours per day. 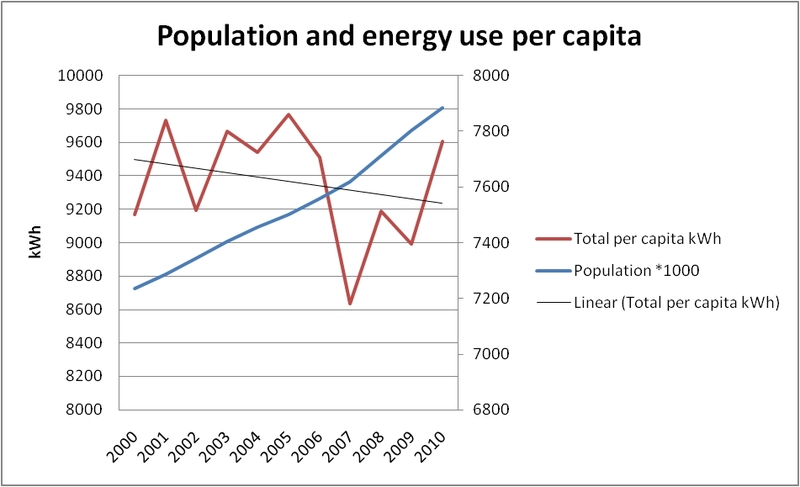 Electricity consumption for light sources is thus fluctuating between those two extremes. Fig. 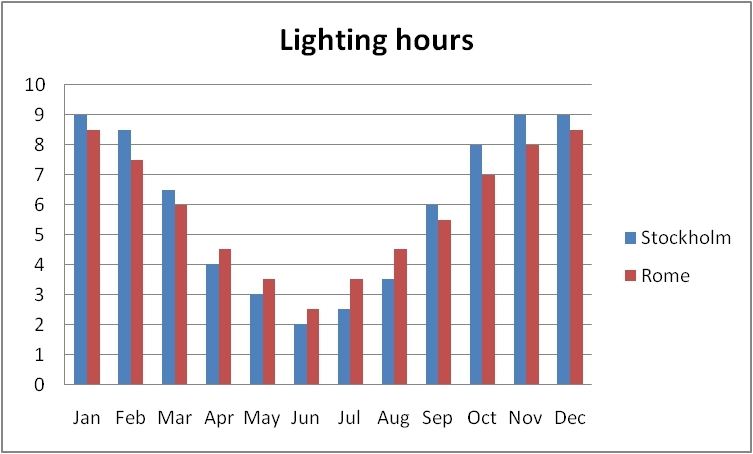 1 shows the distribution of lighting hours in both cities. Fig. 1 Lighting hours in Rome and Stockholm. How much artificial light we actually need is largely determined by the length of the daylight period which in turn is governed by sunrise and sunset. The data for those astronomical observables are easily accessible, clearly highlighting the differences between northern and southern locations. Although these differences may be very large during certain periods of the year, their overall impact on our model is far less dramatic than expected. On an annual basis the number of lighting hours in Stockholm is not very much different from the one in Rome, 2160 vs. 2110, respectively, i.e. less than 3 percent difference. These lighting hours correspond to an average electricity consumption of 432 kWh and 423 kWh, respectively. What is, however, different is the number of heating degree days between the two cities. Correspondingly, the number of lighting hours during the heating period is much larger in northern Europe than in the southern part. 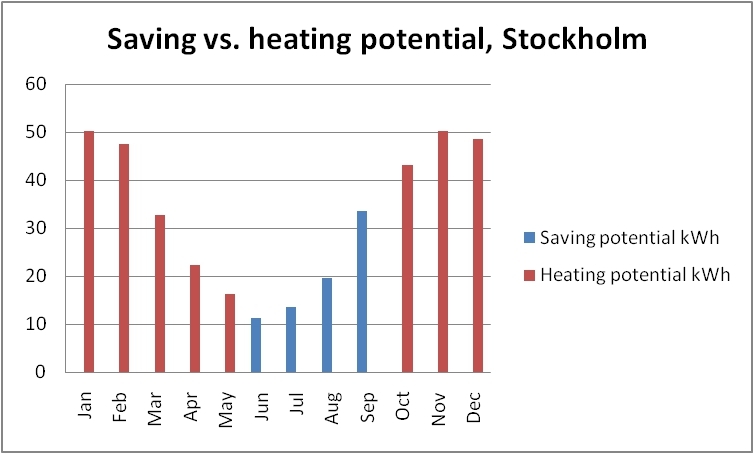 Our analysis shows that more than 80 % of lighting hours are consumed during the heating period in the case of Stockholm. This, in turn, means that during that period there is no gain from using energy saving light bulbs. The respective number for Rome is 62 %. Thus also in southern Europe a substantial amount of lighting is used when people are likely to put on their heating. The rest of Europe lies, in its vast majority, somewhere between these two extreme values. There are exceptions, but these are statistically insignificant. From a physical point of view, energy saving lamps are only useful when it is warm outside, because then there is no need for excessive heat. During winter those lamps do not lead to an overall reduction of energy consumption. Let us look at the situation from the point of view of a classical light bulb. It wastes energy in summer, but not in winter. According to our model, the waste energy produced by a classical lighting system amounts to about 78 kWh (Stockholm) and 145 kWh (Rome), respectively, over the whole year. We may also ask how much heating energy we can save by using normal light bulbs. The figures are 311 kWh (S) and 235 kWh (R), respectively. Thus we may conclude that, physically speaking, the energy balance of classical light bulbs is clearly better than the one of their energy saving competitors. Their contribution to heating in winter outweighs their waste of energy in summer. Of course, the effect is much more pronounced in northern Europe than in the southern countries. But even in the latter ones, the result is undoubtedly in favour of normal light bulbs. Figs. 2 and 3 demonstrate the contribution to heating and the waste energy of conventional light bulbs for the two cities. Fig. 2 Heating potential vs waste energy of conventional light bulbs in Stockholm. Fig. 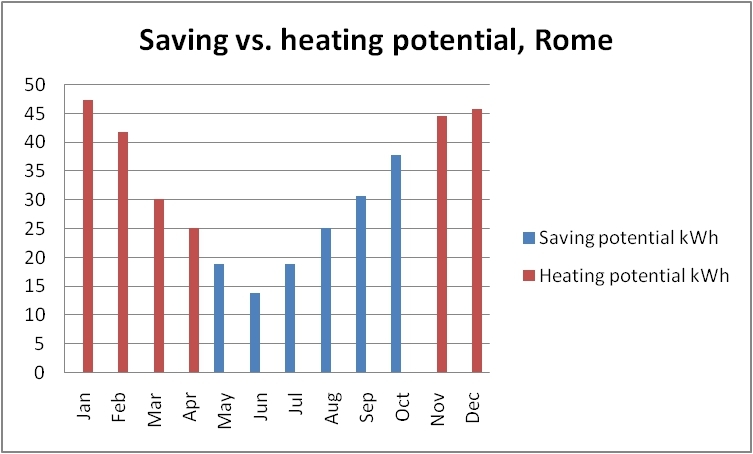 3 Heating potential vs. waste energy of conventional light bulbs in Rome. It is, of course, conceivable that under certain circumstances energy saving light bulbs live up to their expectations. 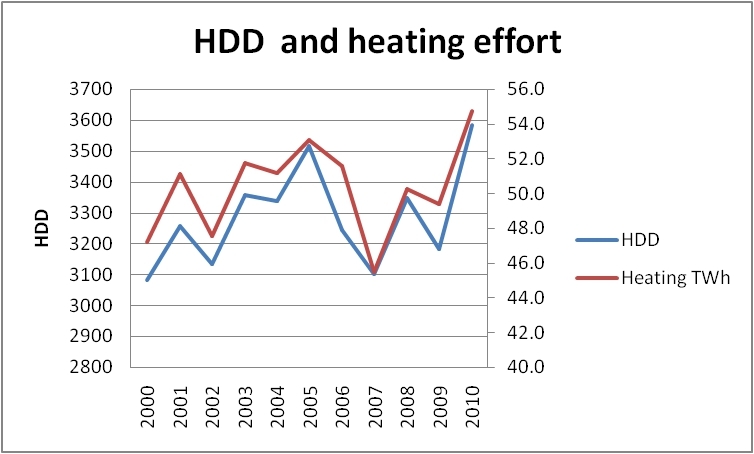 Our model indicates that this may be the case in tropical areas where heating is hardly ever needed. In any case, energy-saving lighting systems are not reducing energy consumption at the level of private consumption which we have considered inour model. This is even less so at a more general level, when taking into account the energy effort for producing and disposing of light bulbs. The recycling of energy saving systems is putting an extra burden on their overall energy balance, therby seriously questioning their high expectations.